I had say I like online storage before that cause it is an easy way to share files with friends. I said I have never enough for this kind stuff. Today, I would like introduce another one that has a special feature to upload your file and host it. Who.Hasfiles is an online hosting site, it offers 100MB space for you for free. To be honest, compare to other online storage site I think that space is too small. What is special of it? Most online storage sites use browser to access your account and upload your files, Who.Hasfiles uses a small software that remote your online storage on your local path. After you setup it you will see a new drive appeared on your computer. That means you do not need use browser to upload your files, you can copy and paste your file to that drive. It is very easy and convenient. 1. Download and launch instant mapper executable. 2. 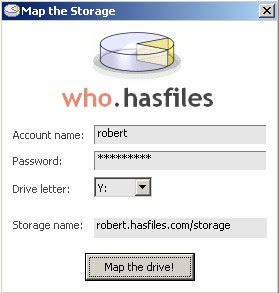 Enter your username and password, pick the drive letter you want, then click "Map the drive". 3. A window with your new drive should open. You no longer need the mapper executable.